Step 3 is the installation of Best Management Practices (BMPs). BMP’s are the most expensive aspect of watershed management. They often involve significant engineering and heavy construction practices to remediate issues that are contributing pollution to Lake Wallenpaupack. These management tools are designed to stop or reduce the flow of pollutants to the lake. Over the past 30+ years, we’ve helped to install and fund more than 100 BMPs throughout the watershed. BMPs can address agricultural waste and associated runoff, stormwater, pesticides, fertilizers, sewage, and erosion. Below are a few examples of projects we’ve completed. Working with our agricultural community is one of the most rewarding tasks we accomplish. Working with our agricultural community is one of the most rewarding tasks we accomplish. Often, they are the most willing to put in extra effort to protect our natural resources. The projects we do for the agricultural community can be beneficial for everyone involved. 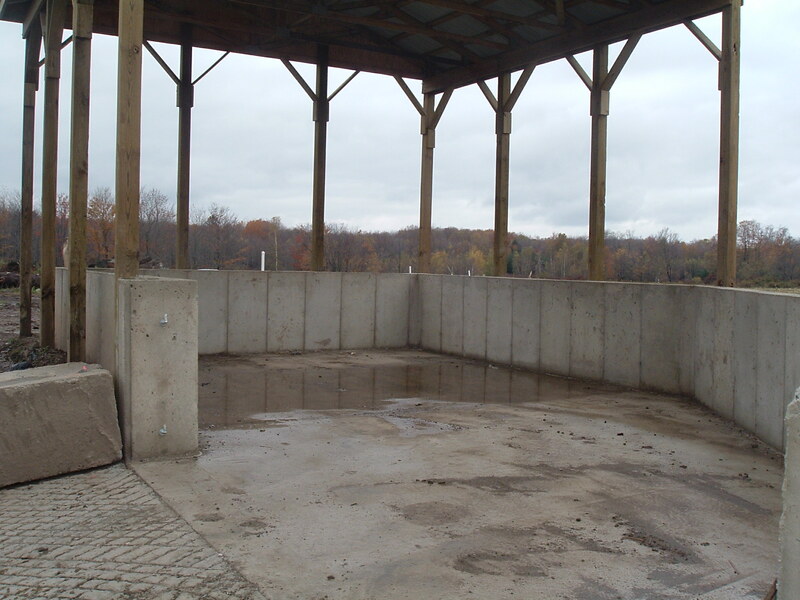 The structure pictured here is a free stall and manure containment system. A single cow is capable of producing approximately 150 lbs. of manure per day. If this manure finds its way into a waterbody the quality of that water can quickly degrade. This structure prevents that from happening. As the manure is deposited, the cow’s hooves push it between slats in the floor of the free stall where it collects in a concrete tank. Not only does this improve water quality by preventing the manure from washing into streams and the lake, it also improves the health of the cow. Instead of the cow standing in manure for hours at a time, it is better enabled to stand on dry ground, thus improving the health of its hooves. Also improving the health of the cow is the open-air style of this structure. A southern facing exposure keeps the cows warm in winter months and the air quality is improved by having a constant breeze moving through the stall. Lastly, these improvements benefit the farmer in several ways. By containing the manure, the farmer is better enabled to apply it to crop fields during optimal application times. This saves money on commercially produced fertilizer. The improved health of the cow also allows it to produce higher quality milk in greater quantities and reduces the need for antibiotics. This all leads to an increase in profit for the farmer and more efficient operations at the farm. Stormwater runoff is the water from rain or melting ice and snow that runs over the surface of the land. Stormwater runoff is the water from rain or melting ice and snow that runs over the surface of the land. The volume of stormwater runoff generated at a given location is affected not only by the amount of precipitation, but also by the type of land on which it falls. In forests and grassy fields, most of the precipitation percolates into the soil or evaporates into the air and only a small amount of stormwater runoff is generated. As an area becomes more developed, with more impervious surfaces such as roofs, streets, and parking lots, the amount of water that percolates into the ground decreases, and the amount of stormwater runoff increases. Stormwater runoff can negatively affect water quality, aquatic biota, and stream temperature. As the stormwater travels across the land, it picks up pollutants such as sediments, oil, grease, nutrients, and toxic chemicals. It carries these pollutants, known as nonpoint source pollution, to nearby streams and lakes. These pollutants can cause many water quality problems. Increased sediments can significantly alter the ecology of lakes and streams. Sediments clog the gills of fish and smother newly-laid fish eggs. Additionally, sediments often carry chemicals, such as phosphorus, nitrogen, and toxins, which further pollute the water. Stormwater runoff from developed areas increases the stream temperature and can stress or kill temperature sensitive aquatic life. Excessive stormwater runoff also increases the amount of water in streams, resulting in flooding and streambank erosion. Stormwater velocity increases. It takes much less time for water to move over paved areas than it does for water to percolate through the soil to the groundwater. Runoff volume increases due to the lost capacity for infiltration. As the amount of impervious surface increases, the majority of rainfall becomes surface runoff. Peak storm flow increases as a result of the increased stormwater velocity and the increased peak volume of surface runoff. High peak discharge causes an increase in the frequency and severity of flooding and causes streambank erosion. streamflow during times of drought. when innovative stormwater management principles are incorporated into the design of new developments and when stormwater management practices are integrated into existing development. Stormwater quantity is reduced by infiltrating the majority of annual precipitation. Infiltration replenishes the groundwater with filtered water and provides stable baseflow for streams throughout the summer and during droughts. Stormwater quality is improved by filtering out nutrients and pollutants. This provides clean and clear water for streams and other water bodies. Peak stormwater volume is moderated by retaining water and releasing it at a lower rate. This reduces peak velocities, minimizes erosion, reduces flooding, and prevents damage to aquatic habitat. Incorporating infiltration trenches, filter strips, bioretention systems, or simply untouched land between impervious areas can minimize the adverse effects of impervious surfaces. Intermediary pervious areas such as parking lot islands slow water velocity, provide filtration and infiltration of stormwater, and prevent sheet flow from becoming concentrated. Development sites should be graded and designed so that stormwater flows onto created or preserved pervious areas. Natural channels and drainage features should be disturbed as little as possible, overland flow should be spread out to encourage infiltration, and natural drainage systems should be incorporated to avoid the use of storm sewers. When buildings and other structures are sited close to one another in a development, a larger area of adjacent land can remain untouched. The natural topography, contours, and vegetation of undisturbed land can treat stormwater more effectively than land which has been graded and compacted by construction. The preserved open space also provides wildlife habitat and a recreation area for the community. Low-Impact Development (LID) is an innovative design strategy for creating developments that are aesthetically pleasing as well as environmentally friendly. The goal of LID is to maximize stormwater infiltration directly on the site in order to reduce the amount of stormwater runoff and increase groundwater recharge. LID incorporates design aspects such as reducing impervious surfaces with onsite BMPs such as rain gardens, bioretention strips, and porous pavement. In addition, LID strategies can be used to satisfy federal stormwater National Pollutant Discharge Elimination System (NPDES) requirements. Structural stormwater control measures should be used to retrofit areas of existing development, or to treat areas of new development if it is determined that the recommended design strategies cannot adequately retain the pre-development drainage pattern and hydrologic response. On-site stormwater treatment systems should be designed to treat the “Water Quality Storm,” which is often defined as the 1.25 inch, 24-hour storm. In much of the northeastern portion of the United States, the rainfall associated with Water Quality Storms accounts for 70-90% of the total annual rainfall. Wherever possible, the runoff from the Water Quality Storm should be infiltrated into the ground. Runoff control measures and treatment systems should be sited as close to the source of runoff as possible to maximize infiltration. Stormwater BMPs can be used to compensate for the changes that accompany development. BMPs should be fully integrated into the developed area, creating a mosaic of stormwater control devices that mimics the natural system. Examples of stormwater BMPs include infiltration trenches, detention basins, bioretention systems, dry wells, wet ponds, filter strips, and constructed stormwater wetlands. Erosion is the movement of land and soil due to wind and water. It is a natural force that forms and shapes the landscape, giving form to river valleys. Erosion is the movement of land and soil due to wind and water. It is a natural force that forms and shapes the landscape, giving form to river valleys. While erosion is a natural process, urban development, agriculture, and other human activities can increase erosion to excessive levels. Excessive erosion leads to increased amounts of sediment in the water. Sediment can degrade water quality visibly by making it darker and cloudier and chemically by transporting pollutants such as nutrients, sediments, pesticides and fertilizers. The nutrients in lawn fertilizers are detrimental to water quality. Nutrients promote the growth of algal blooms that decrease water clarity. When algae die and decay in the water, they consume oxygen, thereby affecting fish and other aquatic life. 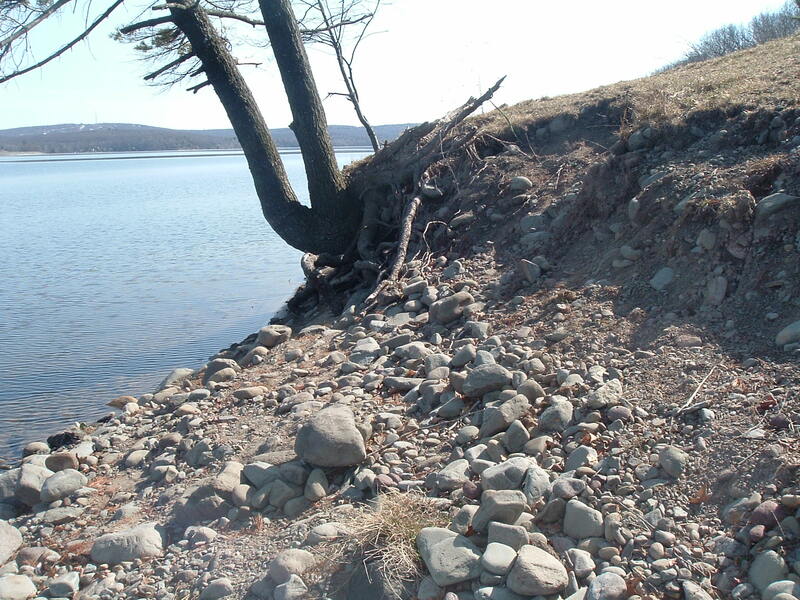 The increased sediment and nutrient loads from erosion pose a serious threat to the water quality and the health of the entire Lake Wallenpaupack ecosystem. contributing pollutants to Lake Wallenpaupack. If we can fund, install, or encourage the use of BMPs, we can keep the lake clean. Much of this is accomplished through grant-writing, project management, and working with the regulatory community on responsible land-use management.